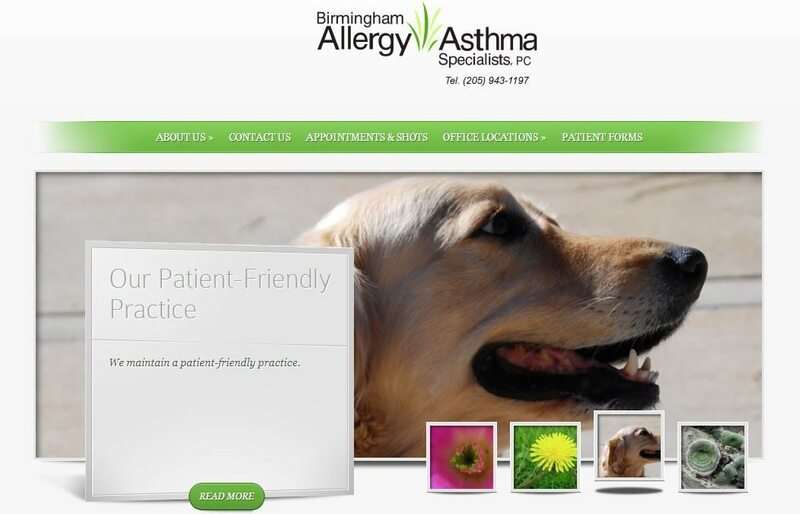 The Challenge: The specialized medical practice of Birmingham Allergy & Asthma Specialists P.C. had a pretty tired website. It was not easy to update. It didn’t render well on smartphones and tablets. It wasn’t linked to the practice’s social media outlets. Time to bring the practice’s website into 2013! The Solution: After conversations with the client to determine what they were looking for, we developed an attractive and very functional WordPress website using one of the many terrific premium themes from Elegant Themes. The site is easy to navigate and loads fast. It highlights, through a dynamic slider and other elements, key features of the practice (including doctors, locations and hours for shots and visits. We went with a color scheme that matched its existing logo. The site permits visitors to find what they need quickly. How do I get to the doctors’ office? When can I schedule a shot? How do I contact the office? We also created a blog section for the practice, which had been missing from the prior site. The site will also communicate with the practice’s active Facebook page. Visitors to the old site (there are still some vestigial links out there of course) will automatically get redirected to the appropriate page on the new site. The site renders well on screens of all sizes (it is “responsive”). The practice is now ready for website visitors on tablets and smartphones (which is a quickly increasing cross section of the online community). The site is imbued with on-page search engine optimization characteristics (but not over-optimized!) to ensure search engines find and index the site appropriately. BAA opted to host the site with GoatCloud (making use of our managed website care program), though has decided to host email elsewhere. No problem! The site software will be up to date, backed up, secure, and functioning smoothly. Of course, we are providing WordPress training so that BAA staff can update content on the fly. WordPress is intuitive to use once you get a basic understanding of how it works. If you find yourself sneezing inexplicably in or around Birmingham, Alabama, or just need a good allergy or asthma specialist, contact Birmingham Allergy & Asthma Specialists P.C. !